Words in RED will be explained in later lessons. The English word "clock" comes from the French word "cloche" meaning bell. The Latin for bell is glocio, the Saxon is clugga, the German is glocke and the Chinese is . A sundial clock or a sun clock was first used around this time. Water clocks were invented in Egypt. 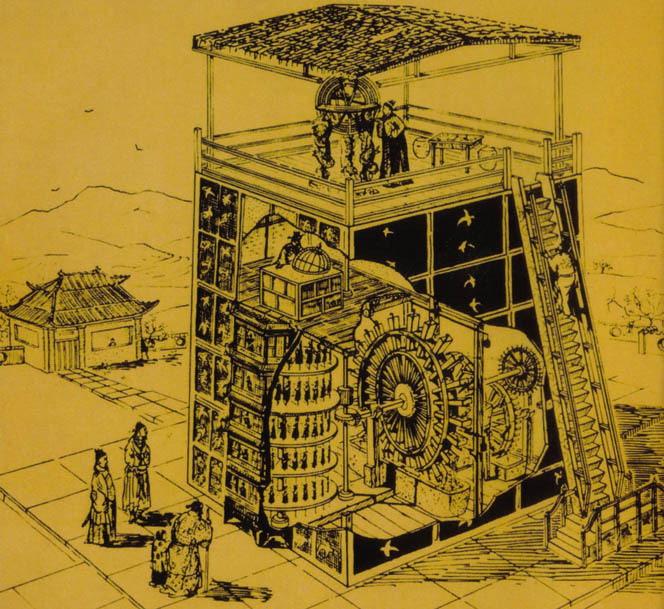 Two Chinese Men ( ) invented the "Water Power Armillary Sphere" ( ) with the function of telling time. Actually, It is like an small observatory and "Striking clock". It will tell the time everyQuarter (Drum) and every Shi Chen (Bell) automatically --- one day was divided into 12 Shi Chen or 100 Quarters in the Chinese culture. 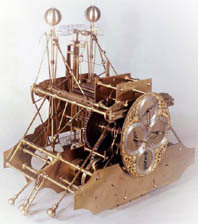 It is categorized as the first mechanical clock in the world because it has a part which is similar to an escapement. A Chinese Man ( ) invented the "Water Power Celestial Globe" ( ) which has all the functions of the "Water Power Armillary Sphere" and can display the current positions of the planets. French, Pierre Le Roy invented the first escapement. He also discovered "Pierre Le Roy's rule", whereby any balance spring has a certain length that makes it isochronous. Italian, Dondi built a clock with a planetarium for the palace in his native town of Padua in Italy. German, Peter Hele invented the first mainspring. German, Peter Hele invented the first portable timepiece. Italian, Galileo, Astronomer and Physicist, discovered the properties of the pendulum. Watchmaking industry commenced in Geneva. Dutch, Huygens, a Physicist, made the first pendulum controlled clock. Dutch, Huygens invented a flat balance spring for the balance in a watch. Peter and Jacob Debaufre, along with Nicolas Facio, are the first to use rubies in watch movements. Abranham-Louis Perrelet invented the pedometer winding system. Abranham-Louis Breguet was making perpétuels, with 2 mainsprings wound by an oscillating platinum winding weight. Levi Hutchins invented the first mechanical alarm clock which could ring only at 4 am. Abraham Louis Breguet patented the Tourbillon. Louis Audemars invents stem winding and setting mechanism. Patek Philippe made the 1st wrist watch. Aaros Dennison of the International Watch Company ( IWC ) invented the waterproof watchcase. John Burge designed the Gothic time lock. Seth E Thomas patented the mechanical wind-up alarm clock that could be set for any time. Cartier produced a lady's wrist watch with diamond and gold bracelet. Longines began wrist watch production. Eterna made the 1st alarm wrist watch. Quartz crystal clocks were invented. The watch was produced in 1929. Patek Philippe produced the 1st perpetual calendar wrist watch. Tissot developed the 1st anti-magnetic wrist watch. NIST (National Institute of Standards and Technology) built the first atomic clock, which was based on ammonia (NH3). Omega Speedmaster landed on the moon. Hamilton releases the "Pulsar", the first electronic digital watch with L.E.D. .
Longines and Seiko introduce a new type of digital display with the L.C.D. .
IWC assembled the Ingeneur which was able to withstand a huge magnetic field of 500,000 A/m. NIST-F1, an atomic clock which is based on cesium (Cs), works with the accuracy to about one second in 20 million years. Seiko Spackwalk - designed and built to accompany the first private individual ( Richard Garriott ) to conduct a spacewalk. Zenith's Defy Lab - New and Disruptive monolithic silicon oscillator replacing classic swiss anchor, hairspring and balance wheel. I will add more critical information as I find it; however, you can search it by yourself. Enjoy !